Given everything in the build up to Borussia Dortmund vs. Bayern München, it was a game that needed to deliver. Indeed, given everything that led up to this game with form and results, Borussia Dortmund simply had to deliver. As it transpired, both Dortmund and the game itself delivered at the best possible time for the Bundesliga. Midweek Champions League fixtures had seen Bayern chalk up another win against AEK and Dortmund lose their unbeaten start to the season away at Atlético Madrid. However, the narrative heading into this was Dortmund flying high at the top of the table and Bayern four points adrift, in stuttering form. The contrast between the two clubs and their newly appointed coaches has been stark. Lucien Favre has quickly settled into the task awaiting him at the Westfalen, so far cementing his reputation as a tactically astute coach who improves teams. Niko Kovac sadly, has looked like he’s on a hiding to nothing from day one. The talk was he was not amongst the Bayern board’s preferred options to take charge, was not really backed in the transfer market and is now at the helm of a largely ageing squad in need of transition. The ongoing politics, rumours and scrutiny have hardly helped and the issues with form have only been magnified by angry and bizarre press conference from Uli Hoeness and Karl-Heinz Rummenigge. The team news saw the much much-improved Roman Bürki ruled out for Dortmund, with Marvin Hitz taking his place in goal. Also notable was the choice of Mario Götze in the false-nine role and Christian Pulisic only on the bench. For Bayern, Thomas Müller started in what looked to be a very attacking line-up. Pre-match, the atmosphere in the Signal Iduna Park was incredible. The sight of the Yellow wall, with their flags waving and scarves held aloft, was everything it’s revered to be. This was perfectly supported by the sheer noise generated by over 80,000 fans in the Westfalen; it was exactly why the Bundesliga is so admired. The atmosphere in the stands was reciprocated by the football on the pitch. It was very clear early on that the Favre game plan was to draw Bayern in and hit them on the counter attack. Indeed, within the first ten minutes Dortmund had three opportunities to punish their visitors, most notably when Marco Reus won the ball from Mats Hummels but failed to beat Manuel Neuer. This risk in this approach from Dortmund facilitated Bayern dominating possession, and inevitably, creating chances. It was somewhat unsurprising when the pressure eventually told in the 26th minute, with a goal that was typical of the Bayern team that we were more accustomed to seeing over recent years. Serge Gnabry was the provider out wide, his cross was headed home by former Dortmund striker Robert Lewandowski. The goal meant the Favre game plan was now ineffective as Bayern continued to dominate possession, but no longer left acres of space in behind for Dortmund to counter attack into. It was clear the midfield was not functioning and that Favre would need to address this and re-think his tactics at half-time. Favre duly acted; Mo Dahoud replaced Julian Weigl and Dortmund began the second half with an increased level of intensity that quickly bore fruit. Neuer, who had been caught on his heels, fouled Reus, who duly tucked away the penalty with aplomb. With Dortmund back on level terms, they look re-energised but more open and just a few minutes later Bayern re-took the lead. Some smart inter-play in the box resulted in Joshua Kimmich cleverly dinking the ball over Hitz and Lewandowski is not the player to miss such an opportunity from close range. It may have been a hammer blow for the hosts, after such a positive start to the second half, but they soon recovered and pressed ahead in search of an equaliser. The pressure from Dortmund gradually increased and only a goal-line clearance from Kimmich denied Reus another goal. By now, the match was a pulsating affair and Paco Alcacer was introduced for Götze on the hour, with Dortmund on the ascendancy. Hummels was enduring a torrid time and was given the hook, much to the delight of the home fans, shortly after Jadon Sancho had robbed him of the ball and almost set up Alcacer. Eventually, Dortmund were rewarded for their efforts and it was Reus again. This time sublimely slotting home a Lukas Piszczek cross from the right. Once again, the match would not be level for long, but this time it was Dortmund taking the lead for the first time, just six minutes after drawing level. This time it was Sancho, who had an impressive second half, winning the ball deep to launch a swift counter attack. Axel Witsel played Alcacer in behind the Bayern defence and he showed great composure, waiting for Neuer to commit himself, before cooling finishing to a rapturous response from the crowd. Bayern looked forlorn and Kovac cut a lonely figure on the sidelines. He made more changes, but to no avail as they failed to re-establish their dominance of the first half. Favre made his own adjustments to stem the late pressure from the visitors. This blistering game was not quite done though and in the final seconds of added on time we had one last moment of drama. A Kimmich cross is finished by Lewandowski and he thinks he’s completed his hat-trick, but it is immediately ruled out for offside and the decision is then verified by VAR. A dramatic end to a dramatic game. Der Klassiker was indeed a classic and the Bundesliga’s showpiece game delivered in every way imaginable. 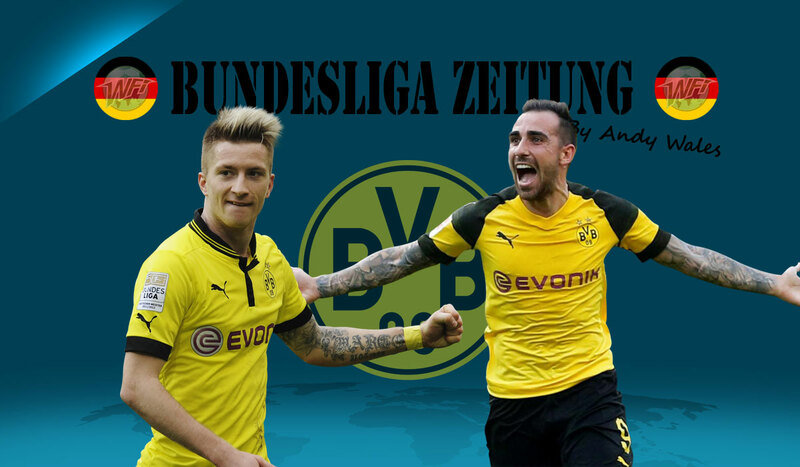 Importantly, this was not only a great showcase event to Bundesliga viewers worldwide, but the fact Dortmund won and moved seven points clear of the defending champions meant it was a shot in the arm for the Bundesliga and exactly what it needed.